Below is a video that we recently took of Nick Halverson and Abigail Vargas golfing at San Buenas Golf Resort with some clients of ours. Golfing at San Buenas Golf Resort is a great activity to enjoy regardless of skill level. This particular afternoon, the group made a last-minute decision to go golfing late in the afternoon. They quickly gathered up their clubs, headed down to pick up the cart, and jumped on the links at about 4 pm. One advantage of golfing at San Buenas Golf Resort is that with their membership program, and for those renters who rent the condominium we manage, clients can enjoy unlimited free golf. That's correct - unlimited FREE GOLF during your vacation in Costa Rica. San Buenas Golf Resort is the only golf course in Costa Rica's Osa region. In fact, it is the only golf course between the country of Panama and Jaco. Here is more information about the golf course at San Buenas Golf Resort. Don't worry about packing your golf clubs, they have plenty of sets for rent. Guests don't need to pack any special gear as golf balls, golf tees and other supplies are readily available for purchase. Additionally, electric golf carts are available for rent. We recommend during the summer months of Costa Rica (December - March) to golf at first daybreak or at the end of the day. Golfing in Costa Rica during mid-day can be very hot, as the sun will be directly above the earth. However, if one is used to weather in Florida during the day, then golfing at San Buenas Golf Resort will be just like golfing at home. 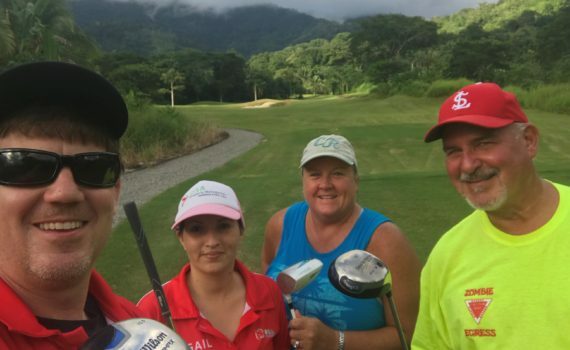 Contact us below if you would like more information about golfing at San Buenas Golf Resort, a Costa Rica vacation rental in Ojochal, Uvita or San Buenas, or if you would like a no-cost, no-obligation, bid to manage your property in the Osa region. 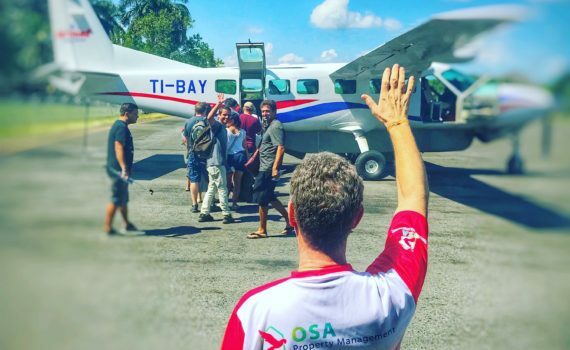 Dennis, the Costa Rican architect is heading back home. We spent a couple days working on the Event Center project, surveying out the land, and getting the direction and layout of how the building will sit on the property. The west east direction is important for airflow, and is affected by the ocean tides. He was very conscious of the direction, to allow the best air-flow coming into the jungle area, and also maximizing space for the various activities that we will be hosting here. (Destination Weddings, Yoga Retreats, Workshops, Business Masterminds, Fundraisers and Celebrations. We learned a lot from this experience. The airline, if you are curious was Sansa, which is a very affordable and efficient airline for those that prefer not to drive from San Jose. (Although it is a beautiful drive some people would just like to get here to their destination ASAP and relax into our secluded spaces, and enjoy the natural habitat of the rainforest.) We can understand that. If you are interested in Costa Rica as a destination for a celebration, retreat or special event, please give us a call with questions. Also, if you are interested in this Event Center Project, we will be looking for a variety of vendors, caterers, retreat coordinators, wedding and event planners to wrk with us as we advance in this project.